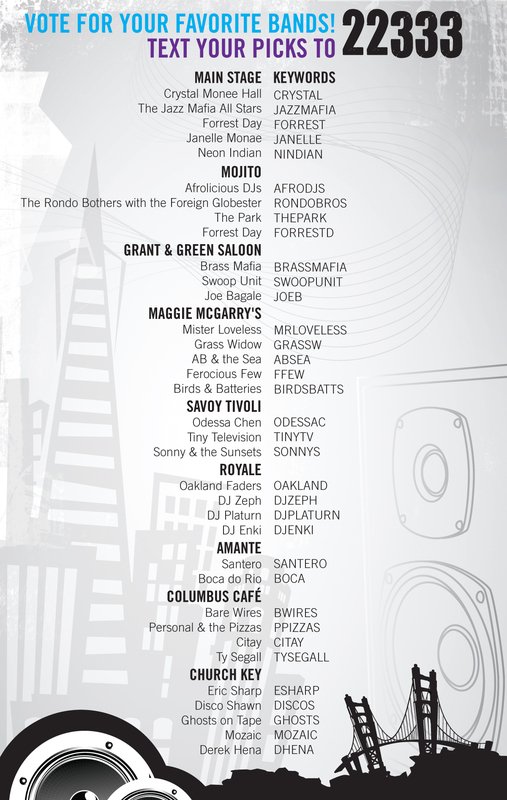 This was SF Weekly’s first music festival and by far the biggest event I have ever planned! The amount of work to get this first-year event off the ground was unbelievable. Luckily, I was not completely alone in planning this and had the help of Sunset Promotions, a well-known San Francisco based promotions company that has organized the SF North Beach Jazz Festival for over 14 years. Since we were doing our music event in the heart of North Beach, they were the perfect people to partner with. One of the main things that Sunset helped us with was booking bands and getting permits from the city. It is incredible how many people you have to go through to get verbal and written permission to do anything on the streets of San Francisco! They also dealt with ABC so that we could serve alcohol on the street. From my end, along with Sunset’s vendor coordinator, we worked on getting and organizing permits for all of our food and product vendors/sponsors. This was not an easy nor small task. Was the vendor high hazard/low hazard? Did they need a permit from the Fire Department? Did they need a tent? A generator? How much space did they need reserved? etc. 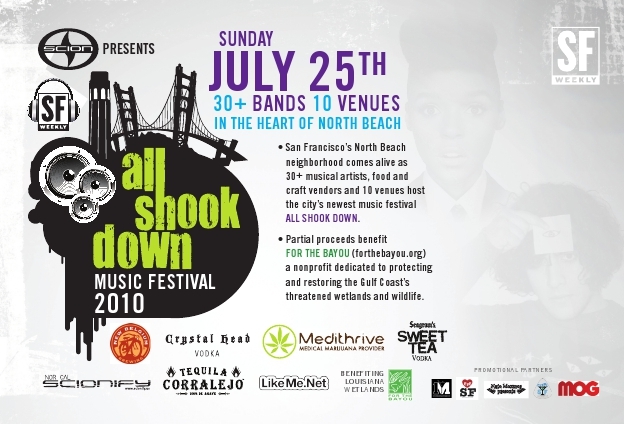 Not only were we going to host this event along Grant Avenue and Green Street in North Beach with an outdoor stage at the corner of Columbus Avenue and Green, but we were also going to sign on 8 of the top bars along those streets to host 3-4 bands throughout the day. One wristband would grant you access to all of the bars (kind of like SXSW). The people of Sunset Promotions, having good relationships with the owners of the bars in North Beach, were able to get Grant & Green Saloon, Maggie McGarry’s, Savoy Tivoli, Royale, Amante, Columbus Cafe, The Church Key and their own bar, Mojito, signed on and ready to rock. They were also able to get Bocce to sign on as the official VIP venue, and Live Worms to be the Staff, Media, and Band hospitality suite. 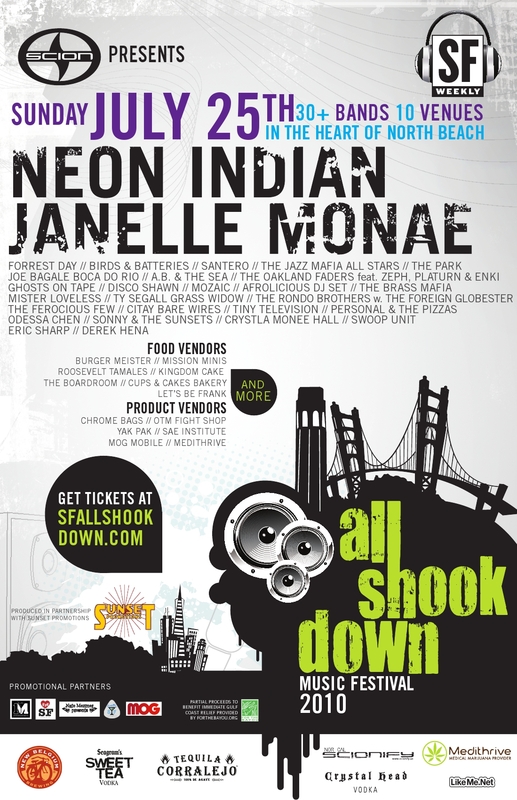 Throughout all of this planning, we sold tickets through Eventbrite and hosted a microsite at http://www.sfallshookdown.com. It is still live for viewing. We made sure to give all of our sponsor’s logo placement, have a link to Eventbrite for tickets, provide information about each band, have the festival map and schedule, what the VIP experience entailed, information on our charity ForTheBayou.org, and how to vote for your favorite bands on-site during the festival. I used Poll Everywhere for this voting platform and tallied the results at the completion of ASD. The winning bands would receive a microphone trophy in their music category at the official awards/after party at the Vitamin Water Social Club. 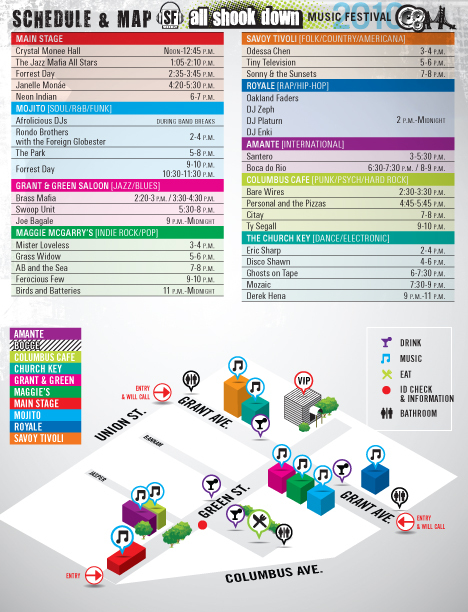 With the suggestions of our Music Editor, Sunset Promotions was able to book a great selection of local acts. 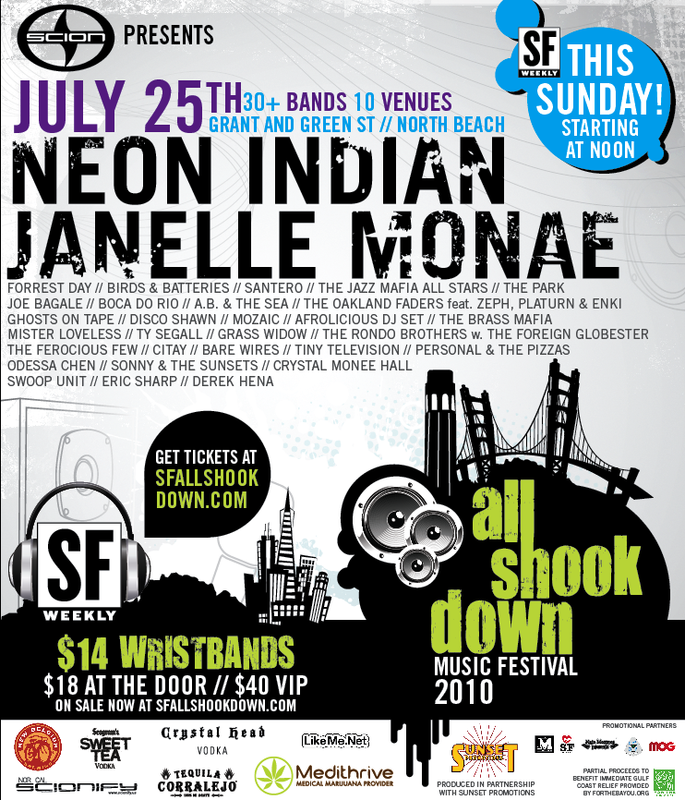 For our 2 national headliners, we were able to book the upcoming soul-funkstress Janelle Monae and the hypnotizing yet edgy Neon Indian. Both put on incredible performances! To help get the word out about this event, and to drive ticket sales, we teamed up with a few local promoters: Nate Mezmer Presents, 1M Entertainment, Crawl SF and Eye Heart SF. We also ran radio ads on Live 105 FM, Alice Radio and MOG Radio. We did ticket giveaways through blogs, radio, social media, and other event-related websites. We even had our PR company LaunchSquad send my press release over the regional wire. Print, web and Facebook ads ran. Fliers and posters were made and distributed/posted throughout some of the key neighborhoods in San Francisco. It was one of the longest and hardest days of my life, but the event was definitely a success with over 6000 people coming through to enjoy the music, the food, and the vendors. We received plenty of post coverage as well, all positive! In total, we had about 12 complaints, which at the end of the day, is not too shabby! So overall, I’d say it was a success, with the knowledge of how to make next years’ All Shook Down even better!